The AFP test measures the alpha-fetoprotein blood level. An AFP blood test measures the alpha-fetoprotein blood level. Why is an AFP blood test important? The AFP test is important because elevated AFP levels are correlated with specific types of cancers. Is any special preparation needed for an AFP test? Biotin supplementation should be avoided for 8 hours prior to getting an AFP lab test. This AFP Test is a blood test. The AFP test, also known as the AFP lab test, AFP blood test and alpha-fetoprotein test, measures the AFP blood level. AFP, as the name suggests, is a protein that is typically found in fetuses. Produced by the yolk sac in the fetus, it functions as a carrier protein in the fetal plasma. The function of AFP in the fetus is largely unknown and levels drop quickly after birth. In pregnant women, AFP levels are sometimes used to screen for neural tube defects and other fetal abnormalities. AFP blood levels have also been found to be associated with specific types of tumors in adults. Liver tumors, yolk sac tumors and germ cell tumor all show elevated AFP blood levels. In this capacity, the AFP test may be useful as a tumor marker for general screening or tracking the progress of a known tumor. AFP testing is not useful as a tumor marker in pregnant women. Getting an AFP test near you at a Quest Diagnostics lab is relatively straightforward. After ordering online and getting your blood drawn, your AFP results will be sent to you electronically when available. 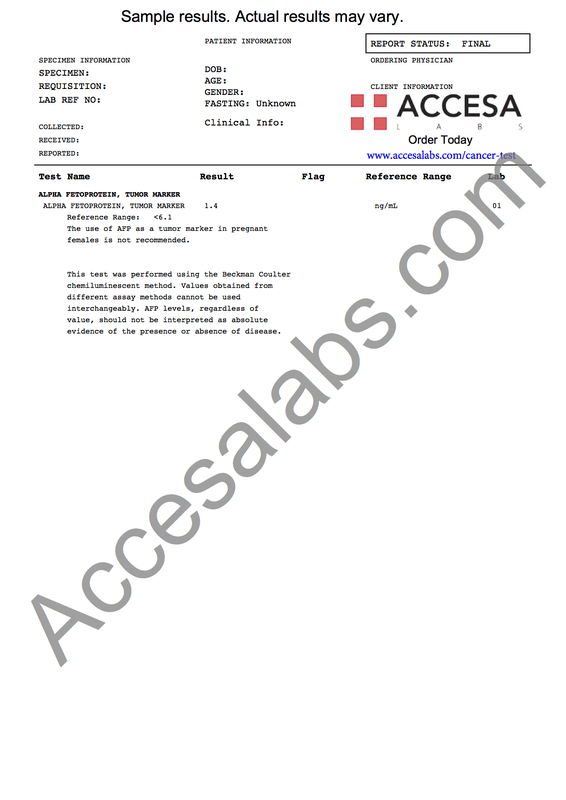 As demonstrated on the sample report in the link above, results will appear as a numerical value in the results column. On the AFP sample results above, a result of 1.4 ng / mL is reported compared to the lab's AFP reference range of <6.1. AFP blood levels cannot be used in isolation as absolute evidence of the presence or absence of a disease and all results should be evaluated in conjunction with a licensed medical provider. The AFP test is sometimes ordered at the same time as the CEA test and the CA 19-9 test. AFP Test at Guaranteed Prices.